Uncle Dan, Mom, & Aunt Darlene, originally uploaded by bill kralovec. 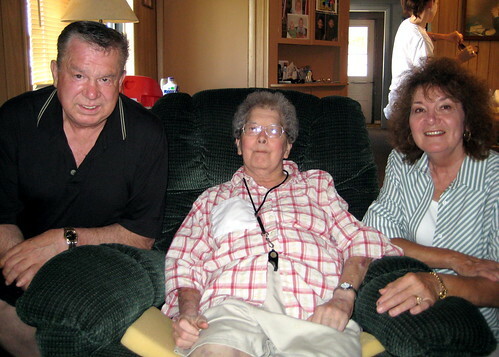 We had a nice visit yesterday from my Uncle Dan and Aunt Darlene. The three Heikkila siblings are shown above. My mother is in the middle. The other surviving sister Ione could not make it, but she came up earlier in the summer. I haven’t seen Dan and Darlene in a while and it was good to sit and talk with them. My uncle Dan donated his kidney to his sister/my mother years ago and has always been kind to my family. Both Dan and Darlene are enjoying their retirement and live in Green Bay, Wisconsin. We spent many of a family vacation when I was growing up staying at their homes. I have lots of good memories of the fun times I had with all of my cousins. Of course on the way home they needed to stop for a Riverside Pizza. The Riverside Bar and Restaurant is a landmark in Iron River. 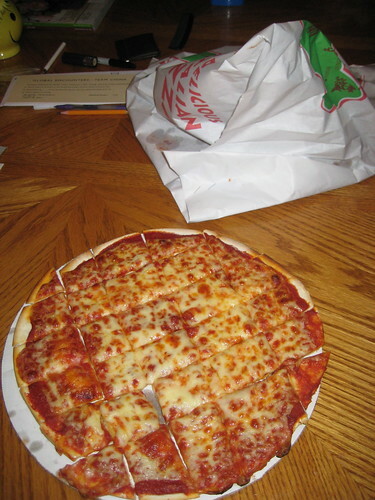 They make a unique pizza that is sliced in little squares instead of the normal big pie pieces. the sauce, cheese and other toppings are delicious as well as the thin crust. A one-of-a-kind pizza that I don’t understand why they never tried to spread it. All tourists and former residents have to eat one during their visit. In the afternoon I went for a physical at the Iron County Community Hospital. I need to get a physical and TB test for my new school. I got a booster vaccine of DTP (diptheria, tetanus, pertussis). I was four years late with the last booster shot received in 1994.